Exactly 47 years after the Soviet Union sent Sputnik into orbit, the creatively named SpaceShipOne spacecraft became the first privately built vehicle to reach space. SpaceShipOne was built by aerospace designer Burt Rotan and his company Scaled Composites, and it was funded by billionaire Microsoft co-founder Paul Allen. While there is no actual boundary for “outer space,” the commonly accepted starting line lies at 100 kilometers of altitude, also known as the Kármán line. SpaceShipOne reached the Kármán line on June 21, 2004. The SpaceShipOne was a huge milestone for private spaceflight, winning a $10 million Ansari X prize (which had been announced in 1996) for being the first non-governmental, reusable manned spacecraft. And it marked the beginning of a shift, with private companies increasingly entering the spaceflight arena. But the SpaceShipTwo marked perhaps a greater shift, in that it was touted as a commercial enterprise thanks to charismatic entrepreneur Sir Richard Branson. Not long after SpaceShipOne’s success, Branson announced a deal to license the technology and use it for his space venture, Virgin Galactic, which calls itself the world’s “first commercial spaceline” and is aiming to democratize access to space. So far, just over 500 people have gone to space, the vast majority working through their respective governments as trained astronauts. Branson’s vision is that traveling on a spaceship will soon be as simple as traveling on an airplane. Virgin Galactic originally expected to be sending citizens up to space as early as 2011. But a SpaceShipTwo model called the VSS Enterprise (which was also built by Scaled Composites) was destroyed in a crash in 2014, a decade after its predecessor made history. Both versions of the rocket use a re-entry system called “The Feather.” Space vehicles have historically used either wings or a capsule design to re-enter Earth’s atmosphere, but The Feather offers a hybrid solution. The wings fold up during the initial re-entry, creating a capsule effect, but can be folded back down when gravity is later needed. During the spaceship’s fourth rocket-powered test, co-pilot Michael Alsbury prematurely unlocked the feathering system, changing the drag profile of the craft and causing a crash. Alsbury died, while his co-pilot suffered a major injury. At the time of the crash, Virgin Galactic had already sold 700 tickets to customers in 50 countries eager to take a suborbital trip aboard a SpaceShipTwo spacecraft. Each ticket cost between $200,000 and $250,000. Those ticket-holders are still waiting for their joy rides to outer space. Ticket sales were suspended for some time following the fatal crash. At the moment, though, you can still apply to be a “future astronaut” with Virgin Galactic via a short online form—and with a $250,000 upfront deposit. The Enterprise incident further delayed Virgin Galactic’s timeline for commercial space travel and served as a reminder of just how risky spaceflight is. It wasn’t just human error that caused the fatality, but the fact that those who built the spacecraft hadn’t adequately considered the possibility of such. Thus, there weren’t any safeguards in place to prevent it. The shift to private companies also poses an interesting challenge in the sense that entrepreneurs are told to think big and fail fast. The first half of that mindset certainly makes sense in the context of manned space flight. But what about the second? Since the crash, another SpaceShipTwo—this one called the VSS Unity—was built by The Spaceship Company (a joint venture of Rutan and Branson). It completed its first free flight last August but has not yet entered rocket-powered testing. The SpaceShipTwo was also recently awarded an operator license from the Federal Aviation Administration’s (FAA) Office of Commercial Space Transportation, “which will ultimately permit commercial operations of the vehicle,” according to Virgin Galactic’s press release on the matter. But even that progress leaves Virgin Galactic—despite its enthusiasm and vision—without a single customer sent into space. The privatization of space flight was in part spurred by the defunding of NASA’s Space Shuttle program, announced under President George W. Bush and executed under President Barack Obama. When we talk about Sally Ride or John Glenn or the Challenger, we’re talking about the Shuttle—humanity’s first reusable spacecraft. (Atlantis, Challenger, Columbia, Discovery, and Endeavour were the Shuttle’s five orbiters, which completed 135 missions over 30 years. The Shuttle system also included two rocket boosters and an external tank). Since the Shuttle program was discontinued, the United States has relied on Russian rockets to get astronauts to the International Space Station (ISS), a habitable satellite that is Earth’s only permanently manned outpost. But it’s working hard to rely on private companies instead. In 2010, $50 million in funding from the American Recovery and Reinvestment Act was spread among five companies (Blue Origin, Boeing, Paragon Space Development, Sierra Nevada, and United Launch Alliance) as part of NASA’s Commercial Crew Program (CCP). According to NASA’s website, CCP was “formed to facilitate the development of a U.S. commercial crew space transportation capability with the goal of achieving safe, reliable and cost-effective access to and from the International Space Station and low-Earth orbit.” NASA has contracted with private companies before, of course. Northrop Grumman—which also had part ownership of Scaled Composite when it built the SpaceShipOne—made the Lunar Module for the Apollo program, for instance. But the CCP offers private companies far more autonomy than past contracts, with the hopes that will make the process cheaper and faster. SpaceX and Boeing are the two major players at work on the actual spacecraft. Thus far, SpaceX has only sent cargo to ISS via the SpaceX Dragon, which completed its ninth cargo trip last July (a delivery that included the first international docking adapter for commercial spacecraft) and its 10th trip in late February. The latter was notable for its launch location. In 2014, SpaceX signed a 20-year lease of NASA’s historic launch pad 39A at the Kennedy Space Center in Florida. Pad 39A hadn’t been used since the last Shuttle mission in 2011 and served as the starting point for countless historic moments, such as the launch of Apollo 11. Before the Dragon’s most recent trip to ISS, it had never been used by a commercial company. While CCP will undoubtedly help transport traditional astronauts, there’s a good chance the technology developed will also fuel the nascent commercial space transportation industry. In fact, SpaceX has already made history on Pad 39A itself, with a milestone that could prove huge for commercial spaceflight. In late March, a previously (successfully) used Falcon rocket launched from the pad, deposited a commercial satellite into orbit, and landed safely back on Earth. The ability to reuse rockets, as SpaceX just demonstrated, could dramatically reduce the cost of spaceflight. And Musk doesn’t just think he can reuse rockets here and there, but rather says SpaceX will eventually have them ready to go again in a mere 24 hours—a timeline that, as Bloomberg pointed out, mirrors that of airline operations today. So while Virgin Galactic hasn’t yet made spaceships as commonplace as airplanes, large strides are being made in that direction. On top of that, there have been a handful of non-astronauts sent into space. In 2001, American Dennis Tito became the first “space tourist,” paying $20 million for his trip to the ISS through a company called Space Adventures—which also relies on Russian spacecraft to get there. Between 2001 and 2009, Space Adventures sent seven citizens on a total of eight orbital spaceflight missions. (One client launched to the ISS twice, Tom Shelley, president of Space Adventures, told me.) All were transported via the Russian Soyuz spacecraft and lived and worked alongside professional astronauts for 10 days or more. “Eric Anderson founded Space Adventures in 1998,” Shelley explained. “A dialogue was first started with the Federal Space Agency of the Russian Federation that evolved into a feasibility study that evolved into Dennis Tito launching in 2001.” Russia has said that when the United States stops using Russian vehicles to send its astronauts into space, it will once again give the vacant seat to space tourists. Additionally, Space Adventures has entered into a relationship with Boeing, established when the company committed to its CST-100 (a capsule-design spacecraft) program, which is part of NASA’s CCP. In fact, SpaceX is so confident in the timeline, it recently announced plans to fly two unnamed private passengers on a trip around the moon aboard its Dragon spacecraft in 2018. The passengers, who have already paid “significant deposits,” will be announced following initial health and fitness screenings, according to a company statement. The precise cost of the trip has not been released. While “general health” may sound a bit vague, Space Adventures has turned away paying customers before due to health concerns. Three weeks before Japanese business millionaire Daisuke Enomoto was scheduled to board the Soyuz, head to the International Space Station, and be the first tourist to do a spacewalk, a Russian medical team told him he was not qualified for spaceflight due to chronic kidney stones. Enomoto had already undergone months of training and evaluations and had already paid tens of millions of dollars—a payment that was nonrefundable. 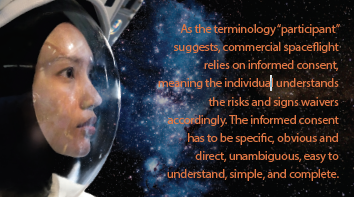 But as Sara M. Langston, a lawyer focused on aerospace law, policy, and ethics, explained, “If you pose a danger to yourself, you also pose a danger to the mission and everybody else on-board.” Besides, spaceflight is an inherently dangerous activity. To call precaution warranted would be a massive understatement. As Langston wrote in a paper on the ethical considerations of commercial space flight, it’s “the first area of transportation where the law precedes the commercial activity.” But while regulations for actual crew members and launch operators are quite stringent, she added, the rules for space flight participants remain vague and broad—and intentionally so. “They’re trying to allow for a new industry to be created and grow,” she said. In addition to signing a reciprocal waiver, SFPs and their heirs are also required to indemnify the government and launch operator in case of death or damage, Langston said. “In order for the commercial space industry to grow and prosper, they can’t be inundated with plaintiffs and cases because anything could happen. You could have a small meteor or debris hit the vehicle and end up with some kind of injury. Additionally, while SFPs are required to sign a waiver with the launch operator, they aren’t required to sign any waivers indemnifying other SFPs. “[Let’s say] one causes harm to another—it doesn’t have to be intentional, but just through negligence, or as a result of a microgravity environment. Let’s say you take off your helmet, the helmet floats, then when you hit gravity again, it hits somebody else on the head. Obviously there is liability—but is insurance going to cover that? There’s no mandatory waiver between those parties,” she said. In terms of medical guidelines, too, there are few requirements. 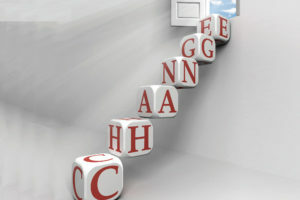 “No regulatory requirements currently exist for SFP medical screening and health selection criteria,” Langston wrote. “The current regulatory perspective is that individuals have the right to participate in novel spaceflight at their own risk.” A lack of standardized requirements, she said, could result in screening, selection, and training discrepancies. “This could lead to increased risk of harm for the individual (in-flight and post-flight), spaceflight and crew, as well as uninvolved third parties,” she added. 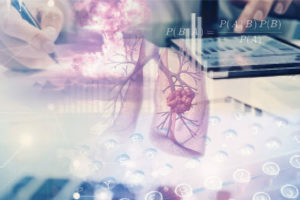 And while it’s recommended practice that SFPs consult with a medical professional with appropriate aerospace knowledge or experience, a lack of standardization could lead to a prospective SFP receiving an incomplete or inaccurate picture of the risks involved in space travel. This is important, as medications affect people differently and metabolize differently in microgravity environments, for instance. “If you have a cold, that may not seem like a big deal—except for the fact that when you have acceleration, deceleration, and a microgravity environment, that can actually impact you (and has impacted astronauts before).” Your medication may not function, or it may function differently. You might have to take different modes of medication. And it may affect you differently once you return to Earth. “There are a lot of different points in this process and a lot of issues that can arise at any of these points,” Langston said. So what can would-be spaceflight participants do to try to mitigate these risks? In terms of insurance, David Wade—who insures space satellites but not spaceflight participants through the Atrium Space Insurance Consortium, which was founded at the beginning of 2007—says: “I don’t think there is anything to stop individuals buying a personal accident policy to cover it, though I’m not sure what the premium would be. I believe some of the early space tourists that went to the space station did purchase insurance cover.” Langston agreed. “They do have to take our insurance as well; if they break anything, they’re responsible for it.” Space Adventures did not respond to an inquiry related to insurance requirements. 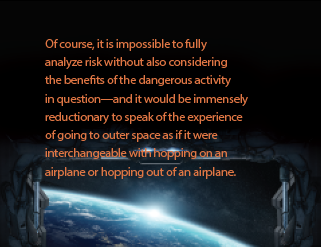 Of course, it is impossible to fully analyze risk without also considering the benefits of the dangerous activity in question—and it would be immensely reductionary to speak of the experience of going to outer space as if it were interchangeable with hopping on an airplane or, if we’re talking more broadly about dangerous activities, hopping out of an airplane. Indeed, “spaceflight participants” is the go-to term, not just to communicate the voluntary nature of the activity but also because a label such as “space tourists” is borderline offensive. Going to space on a suborbital flight or beyond is about far more than getting the best backdrop ever for an Instagram-worthy space selfie. Mark Shuttleworth, for example, was one of Space Adventure’s early clients. Not only was he the first African in space, but he conducted the first-ever experiment to assess the impact of zero gravity on the development of stem cells and embryos; attempted to crystallize HIV proteins in weightlessness to gain insight into its structure; and ran an experiment to assess the effect of microgravity on the cardiovascular system and muscles. In his paper for New Space, Chatzipanagiotis pointed to similar societal benefits to space travel and urged that they be communicated to SFPs as clearly as the aforementioned risk. “Private human spaceflights should not be regarded as a luxurious extreme sport,” he wrote, “but a significant step in revolutionizing space travel. Such flights are expected to encourage technological development, reduce significantly the cost of flying into space, and make outer space gradually more accessible to the wide public.” Additionally, he noted that even private spaceflight could have the same national impact it had during the Cold War’s space race. “U.S. operators could also underline the potential contribution of the industry to U.S. national security, since the United States is a state very sensitive to such issues,” he added. Indeed, Mike Mongo—an “astronaut teacher” who advocates regularly for sending the first kid to space (something not possible even through commercial spaceflight at the moment due to age restraints on informed consent)—argues there is more risk in not pursuing spaceflight than in opening it up. If we legally restrain ourselves for the sake of safety, he said, other nations will continue to take risks and move forward. Mongo believes strongly in the optic value of being the first country to send a child to space and in the snowball effect it would have with regard to continuing to grow the next generation’s interest in STEM subjects—science, technology, engineering, and mathematics—which in turn will grow our country’s technological dominance and wealth. Despite Mongo’s enthusiasm and the overall promise of the burgeoning commercial space industry, there are countless remaining question marks around liability and risk assessment—especially when it comes to sending non-astronauts up on a non-government spacecraft. And airplanes, for instance, are only as safe as they are today because of trial and error. Even once companies like Virgin Galactic start sending everyday citizens to the Kármán line and beyond, many things will likely have to go wrong before insurance companies, launch operators, and other involved parties can get risk right. Because in many ways the biggest challenge to a seamless, safe trip to outer space is also the biggest reason for going in the first place: It’s a new frontier. We don’t know what we don’t know. To that end, it’s also crucial to remember that risk, at the end of the day, is a cultural construct. “If you’re looking at it from a cultural perspective—and I think you have to—then Americans and Russians are very autonomous in that regard,” Langston said. “You have a right to do what you want, as long as you’re not harming someone else.” Whether commercial space travel is a few years or a few decades off, everyday citizens—should they wish to sign on a dotted line and get blasted off this planet with the very real possibility of not making it back—are going to take their chances. Private insurers and public regulators need to prepare themselves for this inevitability, but in the end, it’s the spaceflight participants taking the ultimate risk. ALYSSA OURSLER is a freelance writer. “SpaceShipOne”; Smithsonian National Air and Space Museum website. Accessed April 10, 2017. “Space Race Time Line”; NOVA; PBS website. Accessed April 10, 2017. “Branson Plans Commercial Space Flights”; NBC News; Sept. 27, 2004. “Virgin Galactic’s SpaceShipTwo Crashes in New Setback for Commercial Spaceflight”; The New York Times; Oct. 31, 2014. “Update From Mojave: Successful First Glide Flight Test For VSS Unity”; Virgin Galactic newsroom; Dec. 3, 2016. “FAA-AST Awards Virgin Galactic Operator License For SpaceShipTwo”; Virgin Galactic newsroom; Aug. 1, 2016. “End of an era for shuttle, and NASA”; CBS News; May 29, 2011. “NASA Chooses American Companies to Transport U.S. Astronauts to International Space Station”; NASA newsroom; Sept. 16, 2014. “NASA Sends Trailblazing Science, Cargo to International Space Station Aboard SpaceX Resupply Mission”; NASA newsroom; July 18, 2016. “NASA, SpaceX Sign Property Agreement for Historic Launch Pad”; NASA newsroom; April 22, 2014. “SpaceX Pulls Off First Reused Rocket Mission in Triumph for Musk”; Bloomberg Technology; March 30, 2017. “Boeing delays CST-100 test flights by six months”; Spacenews; Oct. 12, 2016. NASA Commercial Crew Program: Schedule Pressure Increases as Contractors Delay Key Events; U.S. Government Accountability Office; Feb. 16, 2017. “GAO Reports Significant Delays in Commercial Crew Launch Dates (Update)”; NASA Watch; Feb. 17, 2017. “Grounded Space Tourist Sues for $21 Million Refund”; Space.com; Oct. 1, 2008. “Informed Consent: Using Behavioral Science to Make It Easier to Accept … and Easier to Nullify in Court?” New Space; 2016. Unpublished book manuscript, Chapter 5: “Ethical Issues & Considerations”; Sara M. Langston. “Clients: Mark Shuttleworth”; Space Adventures newsroom. Accessed April 10, 2017. The magazine may not be reproduced in whole or in part without written permission of the publisher. 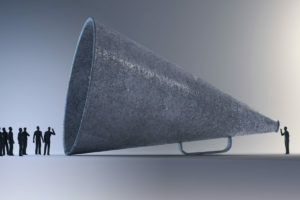 Opinions expressed in signed articles are those of the author and do not necessarily reflect official policy of the American Academy of Actuaries.  © 2019 American Academy of Actuaries.